6pm this Monday, Blue-Eyed Son, a book launch and exhibition of featured artworks of Kurt Cobain, is opening at Manky Chops in Wellington. Monday is the 16th anniversary of Cobain's Death. 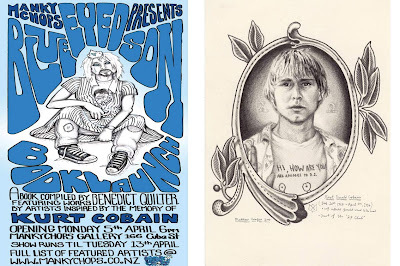 The limited-edition, hardback book features writing by its author and editor, Benedict Quilter and artworks by forty artists responding to Kurt Cobain. 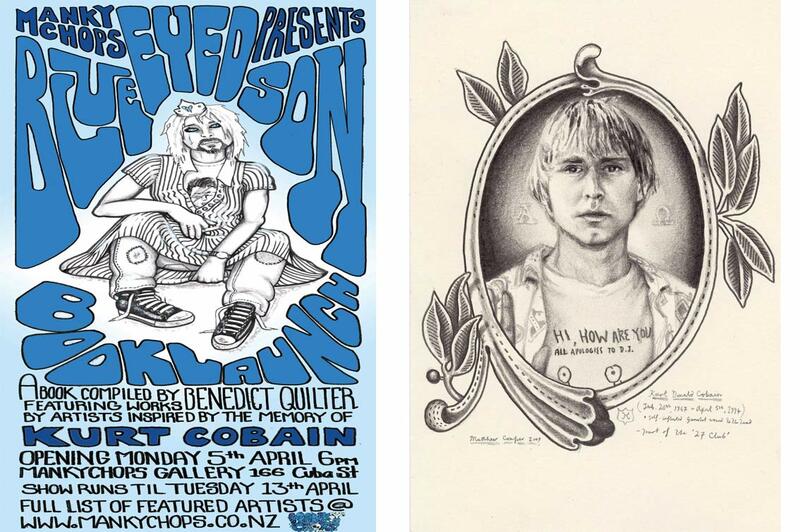 I've included my image on the right - a pencil drawing of a short-haired Cobain, sporting a Daniel Johnston 'Hi, How Are You? The Unfinished Album' Tee-shirt. In the original photograph, Cobain is standing with Flea from Red Hot Chili Peppers. More details about the booklaunch are on the base of the poster on the left - just click on the image below.